Ariane 5 delivered a new record payload lift performance on today’s successful launch from the Spaceport in French Guiana, which orbited a pair of telecommunications satellites at the service of American and Indonesian customers. This heavy-lift mission carried EchoStar XVIII and BRIsat, and it delivered a total calculated mass of 10,730 kg. into geostationary transfer orbit (GTO) – setting a new launch benchmark for the Ariane 5 ECA version. The total included some 9,840 kg. for the two spacecraft, along with the dispenser system and integration hardware in Ariane 5’s dual payload arrangement. 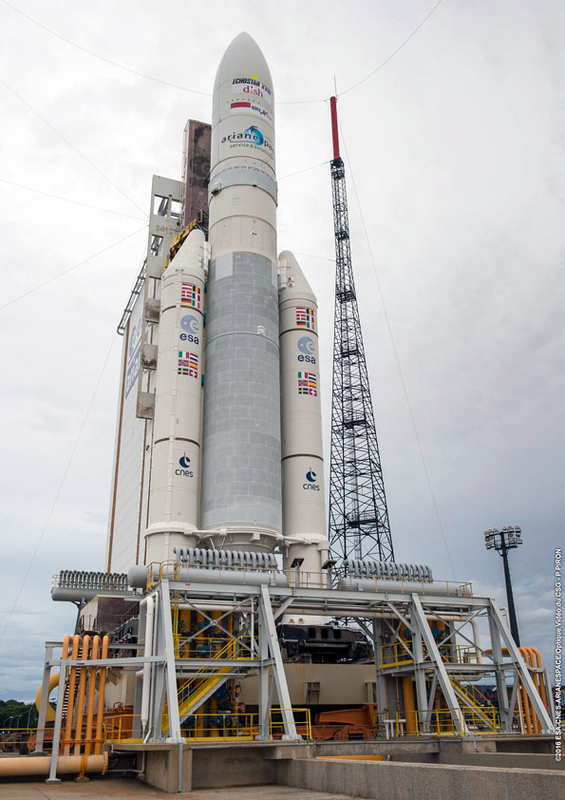 The Ariane 5 for Arianespace Flight VA230 is shown on the Spaceport’s ELA-3 launch pad prior to its liftoff. Highlighting the record lift performance to GTO during post-launch comments from the Spaceport’s Jupiter control room, Arianespace Chairman and CEO Stéphane Israël offered his congratulations to everyone involved with the successful mission. Ariane 5 lifted off from the Spaceport’s ELA-3 launch zone for a 42-minute flight, which marked the workhorse vehicle’s 72nd consecutive success, as well as the 230th flight of an Ariane-series launcher overall. Riding in the upper position of Ariane 5’s payload configuration, EchoStar XVIII was released first during the flight sequence, and is the fifth spacecraft entrusted to Arianespace for launch by U.S.-based operator DISH Network L.L.C. This satellite – which is to be operated from a final orbital position of 110 deg. West – features a high-power multi-spot beam in the Ku-band to assure the highest levels of ongoing service to customers in the contiguous United States, Alaska and Hawaii. “I suppose if it were possible to drink a several-hundred-million-dollar bottle of Bordeaux wine, tonight’s success is exactly what it would taste like,” said Derek de Bastos, Chief Technology Officer at EchoStar, in his post-launch comments. Flight VA230’s lower passenger – BRIsat, which is to be operated by P.T. Bank Rakyat Indonesia (Persero) Tbk. (BRI) – was the second payload released today by Ariane 5. As the world’s first communications satellite dedicated to banking, BRIsat will provide enhanced secure banking communications for more than 10,600 operational branches, as well as to some 237,000 electronic channel outlets and nearly 53 million customers across the Indonesian archipelago. It is to operate from a final orbital slot located at 150.5 deg. East, with a coverage area that includes Indonesia, Southeast and Northeast Asia. In his post-launch comments, Israël also acknowledged Arianespace’s long-standing partner SSL – which is payload prime contractor for both of the spacecraft launched today. Flight VA230 was the first Arianespace mission with two SSL-produced satellites carried on a single launcher, marking a key milestone for a partnership that extends back to 1983. EchoStar XVIII and BRIsat are the 54th and 55th SSL-built geostationary satellites orbited by Arianespace to date, while 10 more are slated for future launches. Israël also gave special thanks to Airbus Safran Launchers, the French CNES space agency, the ground contractors in French Guiana and Arianespace’s own teams. Today’s mission with EchoStar XVIII and BRIsat was the fifth performed this year as part of the company’s launch manifest for 2016. It follows heavy-lift Ariane 5 successes on January 27 (carrying Intelsat 29e) and March 9 (EUTELSAT 65 West A); plus medium-lift Soyuz missions completed on April 25 (with Sentinel-1B as primary passenger) and May 24 (two Galileo constellation satellites).